We have received immense appreciation for providing an exclusive range of Ashtadhatu Stone Rings. This Rings is known as Asht Dhatu Stone Rings and it is embossed with diverse gemstones and metals of different colors. Every Rings possesses different astrological powers and is highly effective in ushering peace of mind and stability. 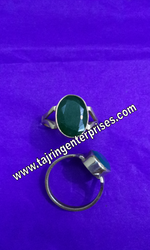 We are among the leading manufacturers, suppliers, and exporters of Panna Stone Rings (Emerald) in the industry. Panna signifies the positive influence of mercury and has a direct impact on education, intelligence level and career prospects. Authentic gemstones have been acquired from trusted vendors for the purpose of manufacturing these rings. Keeping an Dakshinavarti shankh at home gives lot of benefits, but keeping it with oneself proves to be more fruitful. 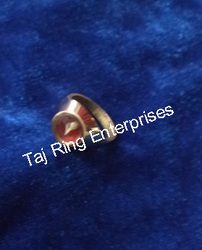 We have kept this miniature shankh (conch) of 6 mm (approx.) in this brass ring & covered it with glass.